Everything you've ever wanted to know about packing for a multi-day rafting or canoeing adventure in the North. You probably already have almost everything you need – we can provide the rest. 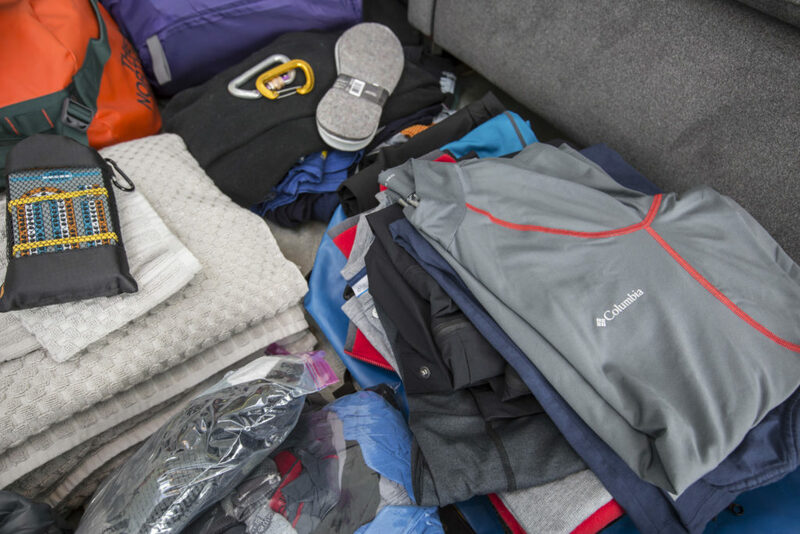 Packing your clothing and personal gear for a river expedition is easy. 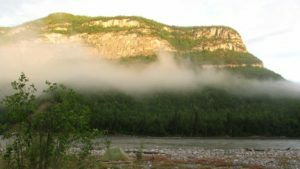 See what you need for a trip on the Nahanni, Alsek, Tatshenshini, Firth or one of many other northern rivers. You will be ready for rafting, canoeing, hiking, wildlife viewing, photography, relaxing and having fun! River travel demands attention to thorough waterproofing of your gear. We will provide you with a large, waterproof river bag (115L or 30 gal.) and a smaller water proof bag (20L or 5 gal.) to be used as a day bag for quick access to items you may need during the day. Upon arrival you can transfer your personal gear into these from your travel suitcase or duffel bag. To organize items inside the large waterproof bag we recommend Ziplock bags. If you have a valuable camera we strongly recommend you bring a waterproof camera bag or case that can be found at your local camera store (one of the recommended types is made by “Pelican” which may be rented from us). Weather conditions in northern environments range widely between extremes. The only fact you can bet on is that it can change instantly. This means that although we may enjoy fine weather we must also be prepared for changes. On any given day you may experience sunny, hot, dry weather that is interrupted by periods of rain or on rare occasions even snow. In general, the weather is moderate with average temperatures of 16°C (62°F) in July, and 14°C (56°F) in August. When packing, please be prepared for heat waves and cold spells. For tundra river trips, please refer to the specific notes in the itinerary regarding weather. The importance of good rain pants and hooded rain jacket cannot be over-emphasized. Consider a hooded jacket and pants made of a coated, waterproof fabric for rain protection(eg. Helly Hansen – may be rented from us, Wet Skins, sailing suit). While Gortex may work for wind and light showers, it is not waterproof. If you choose Gortex for raingear, it must be a top quality multiply suit. It should also be reasonably new and/or recently treated with solutions as per the manufacturers instructions. Please note that the manufacturers state it will not function properly when dirty and performance is increased by a warm iron. We do not bring irons. Foul weather garments made for sailing seem to be among the best for durability and comfort. Bring warm fleece, polypropylene or wool clothing to wear underneath your rain suit. These fabrics continue to insulate even when wet. Cotton and denim are a liability in wet environments – leave your jeans at home. Throw in some wool or fleece mitts with nylon covers, or rubber gloves with a light glove inside, and a wool hat, just for good measure. You may not actually use any of this on the trip but – ‘better safe than sorry’. In fair weather, a pair of shorts or light weight synthetic long pants will work well. Long-sleeved t-shirts will provide protection from the sun in hot weather. Check the What to Bring list (below) for further details and please call with any questions. Layering of clothing will give you the greatest comfort for a wide range of conditions. It is best to use several layers of shirts, jackets, and an outer shell rather than one heavy layer, which will be too hot most of the time. With the layer system you can add or remove layers according to the day and you’ll have something dry in reserve. Having said all this, please don’t let the equipment list put you off. Whether you end up using all or half of the gear on your list, your river journey will be the trip of a lifetime! Remember – except for a few t-shirts and briefs, do not bring cotton! Water proof— the quality of a sealed fabric that does not allow moisture to pass through. Condensation from sweating is controlled by venting through zippers. Icebreaker Wool—a brand that has all but eliminated the “itch factor”. River travel means water underfoot. A standard pair of knee-high rubber boots are recommended (minimum 10” high) for raft (and for two-person canoeists on the tundra or who are experienced with them). Rubber boots may be rented from us. Wear these with a felt insole (we are referring to the “footstep shape” insole, not the type that completely line the boot up to the rim because the later will take days to dry if wet) and a combination of polypropylene and wool/ fleece socks and your feet should stay comfortably warm. Carry a spare set of insoles and socks, and in the case you ‘overstep’ your boots, they can be used to replace the wet ones. If you make your insoles out of closed cell (ensolite) foam, they will not absorb water and will dry very quickly should they get wet. For the tandem canoe trips or rafters who are familiar with them – not on the tundra – we suggest you buy a snug-fitting pair of neoprene booties available at canoe or scuba diving supply shops. Most have integral soles. If you get a pair without soles you may wear them inside tennis shoes. The height should be mid-calf, not ankle height. Don’t be fooled by the ‘surfing shoes’ made of quick-drying material rather than neoprene. They do not provide the necessary warmth. If you are on a whitewater canoe trip, you already know about specs for booties and just remember that the water is cool. Tip: if you use neoprene booties or gloves, drip a teaspoon of hot water in each one in the morning. Shake and test with your finger. Then put them on and luxuriate in the warmth! Sport sandals have become popular. While okay for rugged individuals, remember that the water is cold, especially in the far north. For hiking and camp wear, bring light hiking boots. Be sure they are broken in before the trip to minimize chances of blisters. Important criteria includes: ankle support and sufficient height to keep out bits of debris. 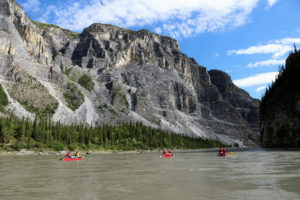 Generally there are very few on the Tatshenshini and Alsek and few on most of the Nahanni and Mountain river trips (we will mostly see them on the last night). Mosquito populations vary according to temperature, rainfall, and wind. Generally, we are able to camp in places that have few or none of the pesky critters. However on occasion, try as we might, we may be unable to avoid them. Be prepared with mosquito repellent and a head net, or better yet, a “bug jacket”. Bug jackets or bug shirts are an absolute necessity on any of our tundra trips. If you cannot locate one please call us for assistance. For many of our guests, fishing is the highlight of our river-based wilderness vacations. The Coppermine and Firth rivers are famous for Arctic Char. All of the rivers we frequent (with the exception of the Tatshenshini, Alsek and Stikine) boast Dolly Varden, Lake Trout, Arctic Grayling and in places Northern Pike. Fishing licenses are available at our rendezvous locations. Your guides can provide details. We are not permitted to provide alcohol within our trip packages. But we will send you a list of spirits which may be conveniently ordered through us, from local liquor stores. These items will be ready for you upon arrival. You are also welcome to bring a beverage of your choice from home (please transfer them to plastic bottles). Please view our What To Bring page for an up-to-date packing list. The following list gives you a general overview of what you will need to bring on your river trip. warm jacket or vest—(i.e. puffy jacket, ski jacket, etc.) An extra-thick fleece sweater and windbreaker could substitute. rain jacket (hooded) and pants—VERY IMPORTANT—must be waterproof and good quality—a poncho is NOT acceptable. long underwear (not optional)—tops and bottoms—polypro is best (avoid cotton). There are various weights: light, medium or expedition. Pick what is most comfortable for you, keeping in mind that you can layer your clothing. personal toiletry items—soap, towel, shaving gear, tooth brush, skin cream (to avoid severe drying of hands), etc. insect repellent and bug jacket. We strongly suggest that you bring a bug jacket—they’re light weight and pack easily. We do sell “The Original Bug Shirt.” Call us for details. camera—spare battery, extra memory card, USB phone charger if using your phone as a camera. We recommend a waterproof box to protect it. fishing rod and equipment (collapsible please). trekking poles—collapsible walking stick(s) (These are excellent for your knees & balance while hiking. Use them like ski poles.) You can now rent them from us. knee pads—our canoes have knee pads and most trips do not require much kneeling. If you have to ask, you probably don’t need them. paddle—only if you prefer to use your own. PFD—only if you prefer to use your own. 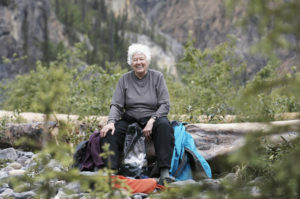 wet suit or dry suit—mandatory for all Nahanni canoe trips and Coppermine canoe. Consider it for the Tatshenshini and Firth. We provide wet suits for rent on all rivers of Grade III. On the Alsek River they are included in the package. Wet suit rental must be confirmed 90 days prior to trip departure. If you’re the type that cools easily, you should consider a wet suit for any trip—3mm neoprene, short or long legs; sleeveless preferred.